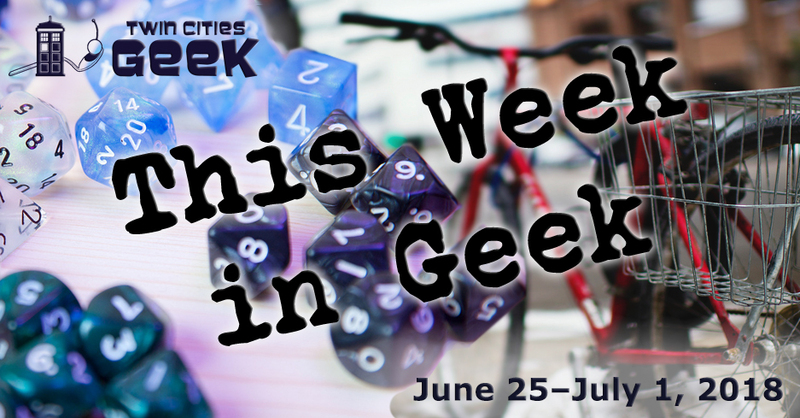 Welcome to This Week in Geek, your guide to events of interest to the Minnesota geek community for the week of Monday, June 25th to Sunday, July 1st. Support Doctors Without Borders while watching some of the best speedrunners around at Summer Games Done Quick. This event is a series of video-game tournaments that has raised over $14 million for charity to date. There will be a packed schedule of video-game speedruns, running the gamut from new classics like 2016’s Doom, to old classics like Castlevania. Preregistration is closed, but check out their website to reach out to the event planners if you are interested, or to see a full schedule of events. When: Monday, June 25th at 6:30 p.m. When: Monday, June 25th at 7:00 p.m. Celebrate the loveliest of all beasts with the all-powerful Monster Science Ensemble! The Ensemble will enlighten with poems, songs, and dances focused on the loveliest and most-magical fantastic beast: the Unicorn. This event features the talents of Kate Kunkel Bailey, Hawona Sullivan Janzen, Nissa Nordland Morgan, Heather Jeanne Rand-McKay, Mickaylee Shaughnessy, Natalie Rae Wass, Tim Wick, Bryan Thao Worra, Jena Young, and is hosted by Reverend Matt. This is a free event, so educate yourself. When: Monday, June 25th at 8:30 p.m. Enjoy an evening of community and movie magic under the stars! Movies start at dusk and are free and open to the public. Screening this week is Wonder Woman, a historical action-adventure film with a strong dose of empowerment from the DC Universe. Bringing a blanket or lawn chair is recommended, and children under the age of 10 must be accompanied by an adult. When: Tuesday, June 26th at 7:00 p.m. Enjoy a night of community and tea with Tea and Meeples, a weekly gathering of friendly geeks at Panda Castle in Richfield. This week, the group will get together for a night of outdoor games and enjoy a dinner of grilled veggie kebabs. When: Tuesday, June 26th at 7:30 p.m.
Come and experience YogaQuest, a blend of yoga and fanfiction storytelling led by certified yoga instructors. Experience a yoga workout experience and a story at the same time. The theme for this week is Captain America: Civil War, so it’s a good time to decide if you’re either on Team Cap or Team Iron Man if you haven’t done that yet. This event costs $15. Join your fellow Whovians and trivia fanatics at the Driftwood Char Bar on Wednesday night for Minnesota’s only regular Doctor Who-themed trivia night, brought to you by the creators of TC Trek Trivia. This is an all-ages event with no cover, so expect seats to go quickly. This month’s theme is “Put Some Captain in You,” so expect a focus on Captain Jack Harkness. When: Friday, June 29th at 3:00 p.m., and Saturday, June 29th at 10:00 a.m. This new summer book fair is to be held at the Progress Center on the Minnesota State Fairgrounds, and is supported by Rain Taxi. Come on down to see great collectible books, first editions, maps, prints, pulp fiction, vinyl, and other offerings. There will also be activities like a scavenger hunt, letterpress coasters, music, a paper-art exhibit, a giant word cross, and much more. Friday entry is $10 and gets you a first look at the selection along with special activities, and admission on Saturday is free. When: Friday, June 29th at 6:00 p.m. When: Friday, June 29th at 7:30 p.m.
Do you need a raunchy and bizarre behind-the-scenes look at the world of professional puppet television? If so, come on down for a night of comedy that is live, filmed, and behind the scenes at the same time! Witness the “adult” things puppets get up to between takes, and enjoy some great improv. Tickets are $20, and this event is not intended for children under the age of 16. When: Friday, June 29th at 8:00 p.m., and Saturday, June 30th at 3:00 p.m. and 8:00 p.m.
As geeks, we seem to be drawn to imaginary sports such as quidditch, zero-g laser tag, brutal blood sports involving child tributes, and podracing, so come and see the greatest sport that never was: Human Combat Chess. This game looks like chess on the surface, but unlike chess, the results of moves are not certain and come down to choreographed fights between the human pieces involved. General admission is $18, while kids can get in for $5. Want to learn more about Human Combat Chess? Check out our piece on last year’s performances! When: Friday, June 29th 8:30 p.m. When: Saturday, June 30th at 11:00 a.m.
Get your summer geek on in St. Cloud with an event focused on anime, crafts, D&D, Pokemon, Magic: The Gathering, trivia, artist panels, prizes, Yoga Quest, and more! There will be a number of special guests in attendance, including Jaime Coker, Ryan Schepp, Heidi Jeub, Jonathan D. Wilson, and Steffany Schmit. This is a family-friendly event and costumes are strongly encouraged, so get creative! When: Saturday, June 30th at 6:00 p.m. Adult Swim, the Cartoon Network-affiliated creator of geek favorites like Rick & Morty, Sealab 2021, and Aqua Teen Hunger Force, will be returning to the Twin Cities for an evening of promotional screenings, unaired episodes, games, prizes, local vendors, and activities. This is a great way to combine being outside and around people with the act of consuming comedy TV. Tickets are $10 for open seating in advance, or $15 day of. When: Saturday, June 30th at 11:59 p.m. When: Sunday, July 1st at 10:00 a.m. When: Sunday, July 1st at 12:00 p.m.